While environmental history tends to be a predominantly intellectual exploration of the human relationship with the environment, this film reminded me of the myriad other ways human beings can experience the environment. Shugendo is a syncretic religion, in that it combines a number of religious traditions, including Shinto, Daoism, tantric Buddhism and shamanism. Fundamentally however, like Japanese folk religion (and those of many cultures around the world, including Maori cosmology), it recognises a sacredness in the natural world, which often manifests itself in gods (kami), in trees, rocks and water bodies – among other things. In New Zealand, as is the case in much of the western world, our relationship with the natural world has moved from the animism of the pre-Christian pagan world, to one where we have come to see the natural world as either a barrier to progress or the source of exploitable resources, rather than a source of spirituality. Indeed, early missionaries, such as Cort Schnackenberg, regarded the Maori tradition of recognising gods in the trees and forest as an evil that their culture had to be purged of (see Geoff Park’s Nga Uruora). Unlike in Japan, where sacred places of worship are almost invariably found within nature – shrines or temples surrounded by “sacred groves” or within the depths of the forest itself – western places of worship are, generally speaking, wholly human-created artefacts, which explicitly eschew the power or influence of nature. But despite that, many of us – whether identifying ourselves as religious or not – encounter something distinctly spiritual when we experience a mossy beech forest walk, a mountain forest waterfall or come face to face with an ancient podocarp giant. For those interested in the environment, culture, or religion, I highly recommend this documentary. For a taster, view trailer (impressive in itself) here. 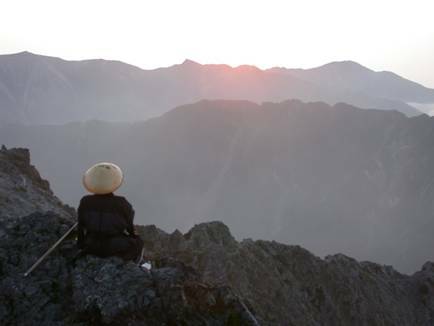 Photo: Shugendo priest contemplating mountain landscape at sunrise (Scott Schnell). That Japanese whakatauki reminds me of another: “Hokia ki o maunga kia purea e koe I nga hau o Tawhirimatea” or return to your ancestral mountains to be cleansed by the winds of Tawhirimatea. Everyone has a sacred mountain so they must be everywhere! I will have to check out this doco.